Description: A small CPU monitor (MUI) with freeze/setPri/break/ option by Thomas Igracki. 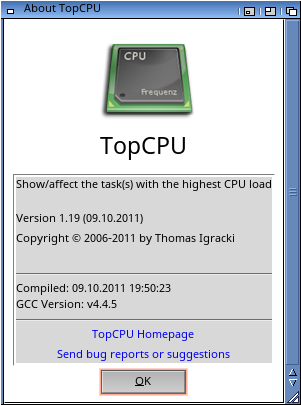 TopCPU is cpu monitor which displays the top 5 tasks with their cpu usage. Additionally it displays the total system cpu usage. cpu usage representing the current cpu usage. a task with ctrl-C,D,E or F.
The window border will be transparent if the window gets inactive! This can also be adjusted so that the window border is always transparent or never. The window can be a backdrop window. TopCPU displayed only a "'" as name! Chg: Renamed the menu item "Prefs/Only CPU" to "Prefs/Only System"
New: New menu item "Prefs/No SystemLoad"
New: New menu item "Prefs/No Gauges"
from everywhere in the group/window! the number the user selected. window border to "Auto", "On" or "Off"